I recently acquired my very first ice cream/frozen yogurt/sorbet maker. How cool is that, right? I secretly always envied those that already had one because they are able to make combinations that you just can't find at the grocery store. I'm not really a big fan of ice cream, but the ability to make sorbet is mostly was lured me in. Something about the smoothness of a sorbet is just so simple, appetizing and inviting. Well, with every new appliance that enters my house, I have to use it to it's full abilities. This means that I had to make an ice cream right away. My husband is an ice cream freak, but sadly for him, my first attempt had to be a coconut flavored concoction. He hates coconut. He went to Dairy Queen that night. Anyways, the coconut is so full of flavor and so creamy that I've looked and looked around near here but haven't been able to find anything that compares. I haven't even found anywhere - except Baskin Robbins - that even carries coconut. The Baskin Robbins one has nuts in it. While I don't hate nuts, I usually prefer my ice cream au natural. Well, my new ice cream maker gave me the opportunity to try making my very own coconut flavored ice cream and, if I do say so myself, I have succeeded in trying to recreate the flavor of the Kilwins' version. In fact, I think I might even like mine better. The batch I made doesn't consist of your typical ice cream ingredients so it's one of those things that is good on occasion, in moderation. I was scouring the internet to see what others had done when I came across one site that had a very interesting looking recipe. This particular one used evaporated milk instead of cream along with the coconut ingredients. I immediately was drawn to the peculiarity of this and decided that I would base my recipe off of it. You can check out that original recipe here: http://chocolateandzucchini.com/archives/2007/09/coconut_ice_cream_from_the_pantry.php. I knew I still had a can of evaporated milk left from my Christmas baking so grabbed that, a can of coconut milk (yes, I pretty much always have one on hand) and a few other ingredients. Five minutes later, I was finding it hard to stop tasting the mixture that would eventually find it's way into my new machine. After it whirred for about a half hour, I stuck it in the freezer to firm up and patiently waited for my final tasting. All I can say is "Wow." This is seriously some of the creamiest, coconutiest, yummiest ice cream I've ever had. 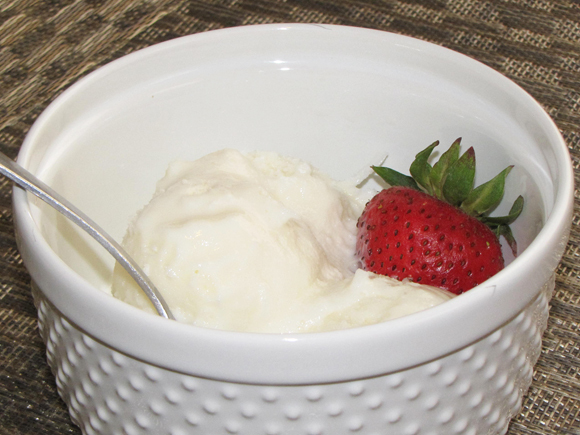 They say you can't make gelato in an ice cream maker, but this came pretty darn close! 1. 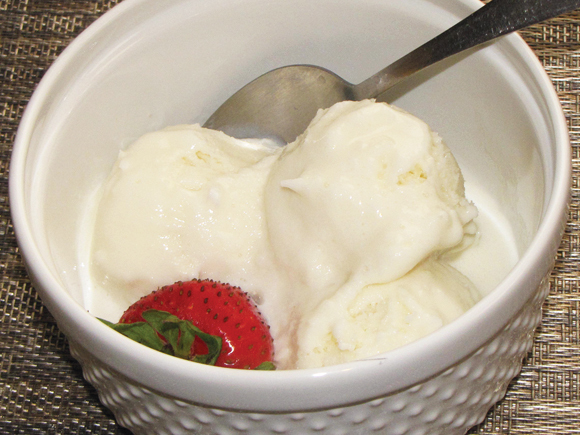 Mix all ingredients, except shredded coconut, together then pour in ice cream maker per appliance instructions. 2. Add shredded coconut during last 5 minutes of cycle. 3. Set in freezer for at least an hour to firm up.